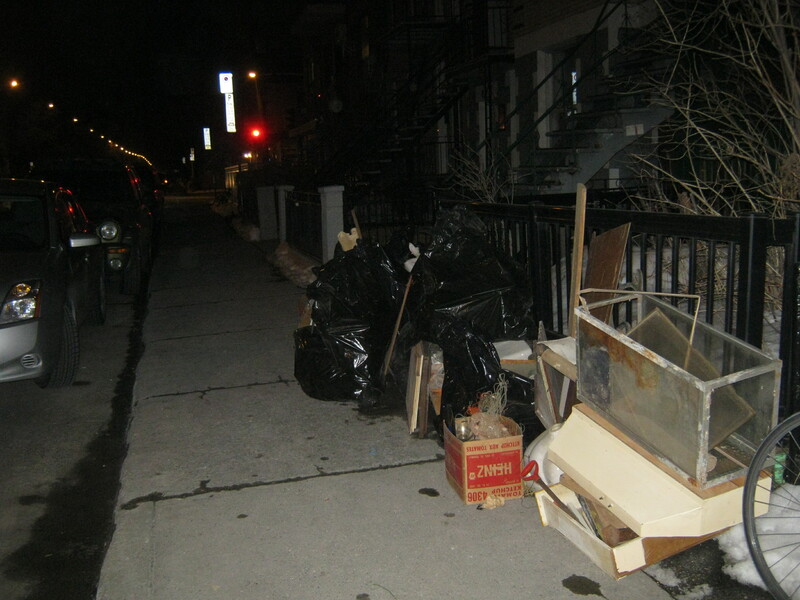 Last night I came across this pile of trash on St Urbain near Fairmount. It’s the place where an older Ukrainian woman lived for a long time but passed away. She reputedly never threw anything out, so cleaning out the house was quite the task. 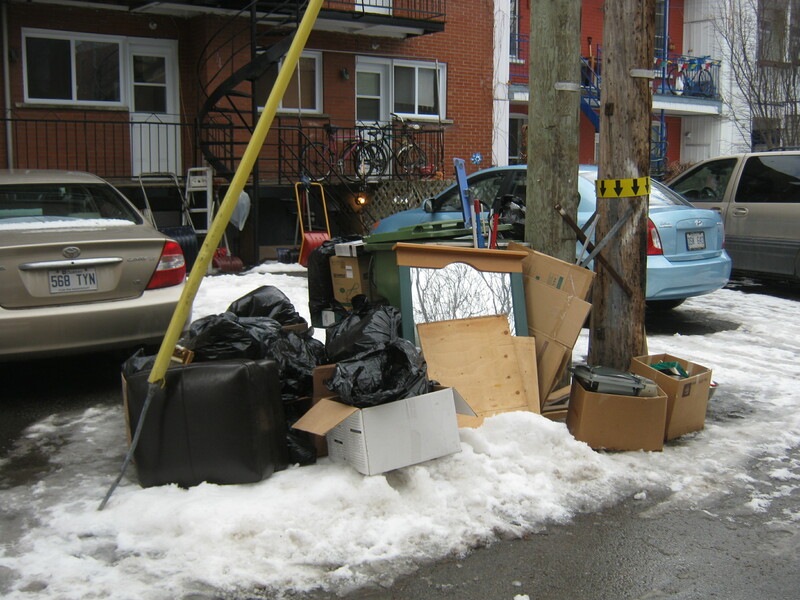 The trash is more renovation related now, but there’s still evidence of the person who lived there for so many years. 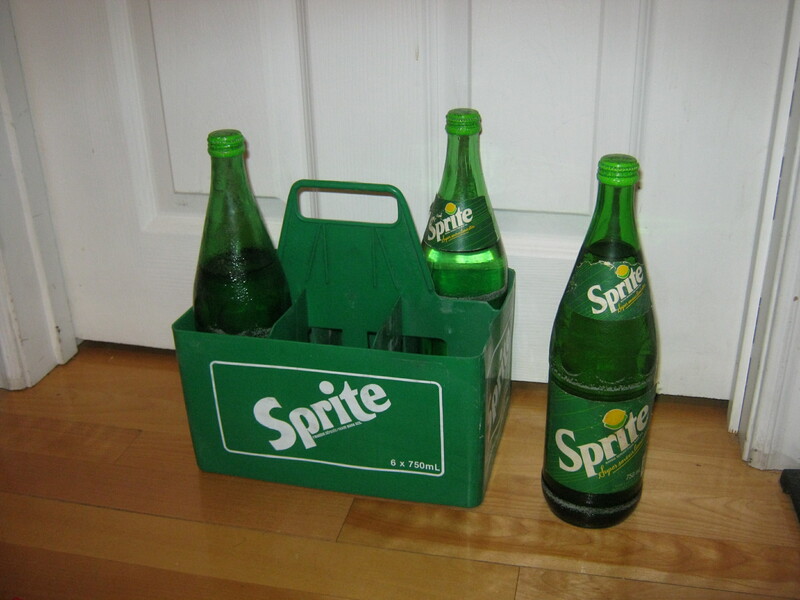 I found these three unopened Sprite bottles in an original plastic case. I figure they must be from the 1970s. A couple have evaporated a bit but one still looks like it has the original volume. A little shake shows that there may still be a little bit of carbonation in there. I may do a dare with my roommate and try one… not sure about that yet though! I also found some cool old boxes. The “Megantic” ones were made for the pins in clothespins. 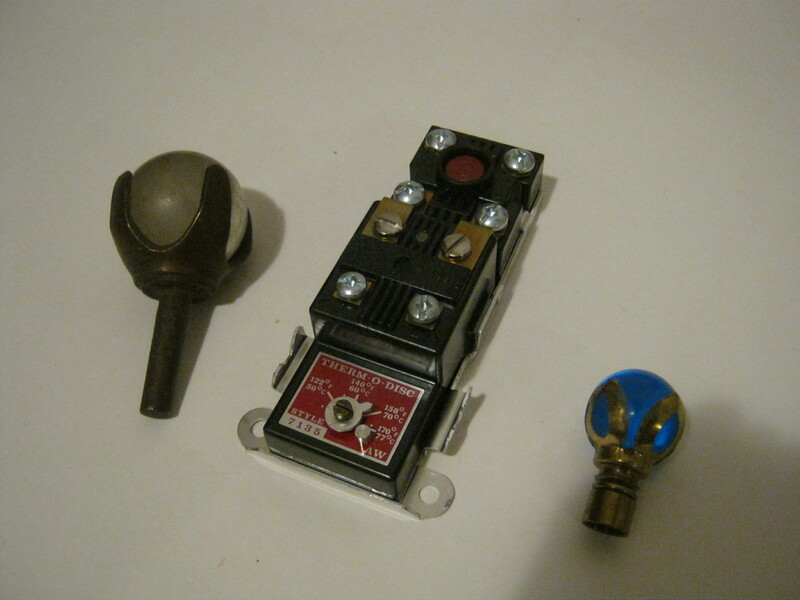 One still contains the pins and the other contains the wood part. There’s a box for “Esplanade Paper Clips,” which I figure is a long-extinct company out of Montreal. 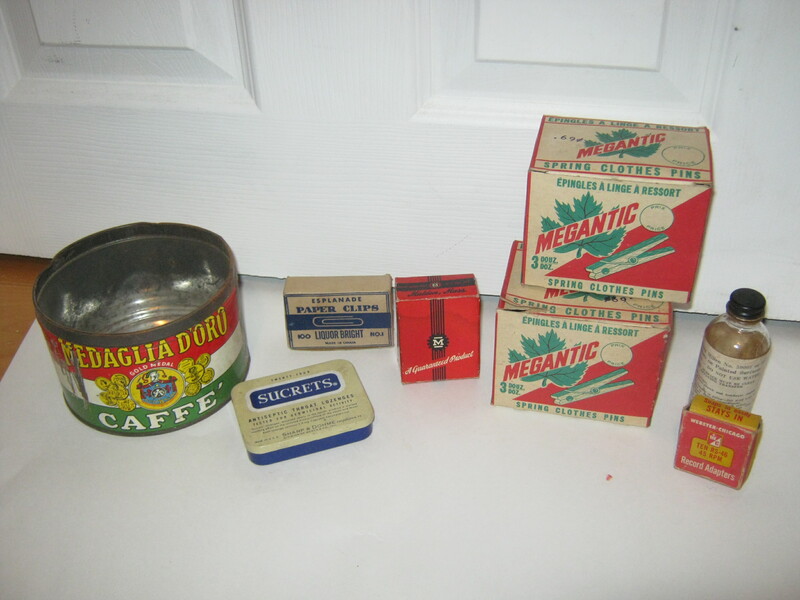 I also like that old coffee tin. The tops of a couple of old lamps and some electic thermometer thing. I thought the lamp-tops could be cool for someone’s art project. Now for some things I found this afternoon. I came across this pile of stuff. There was a lot of religious paraphernalia. 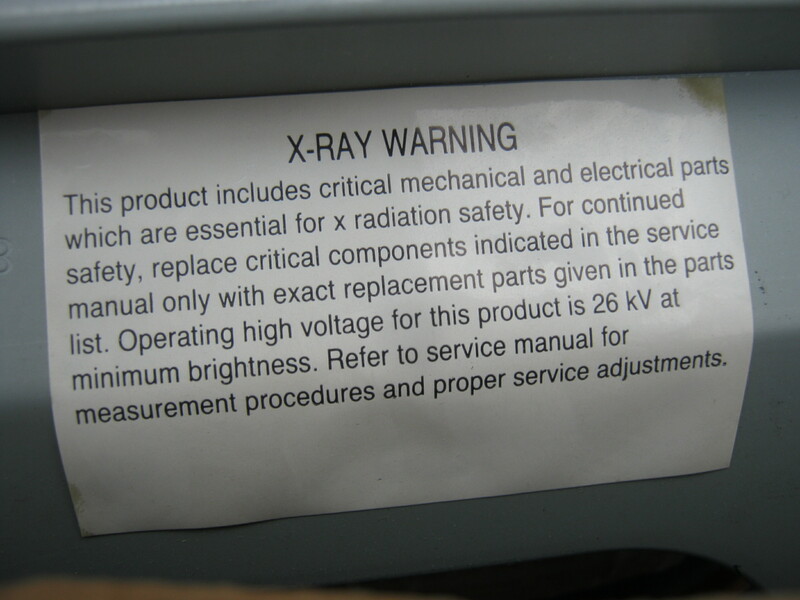 There was this odd looking machine with this warning about X-rays. Is this a normal warning to find on electronics? I didn’t feel like it was and left it behind, especially since it was missing some parts. 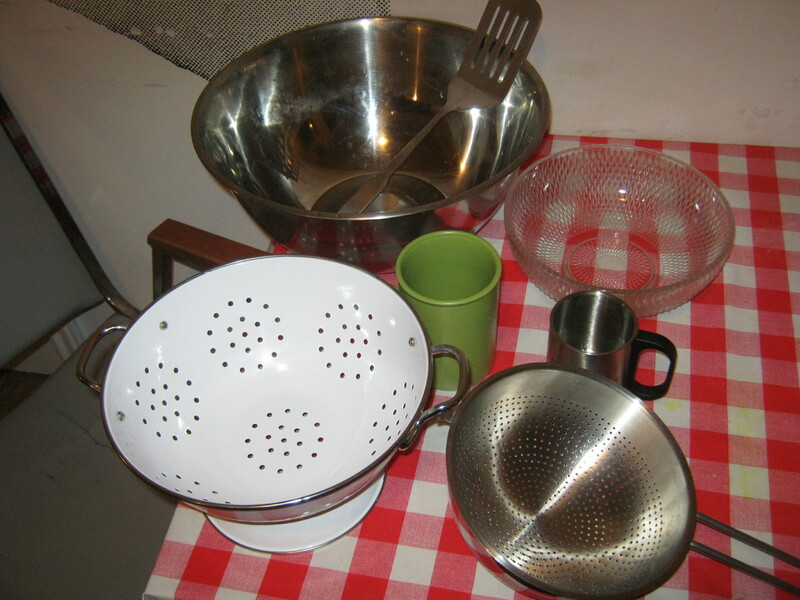 I found a bunch of kitchen stuff. My favorite are the new strainers, which are definitely better than my old plastic ones! 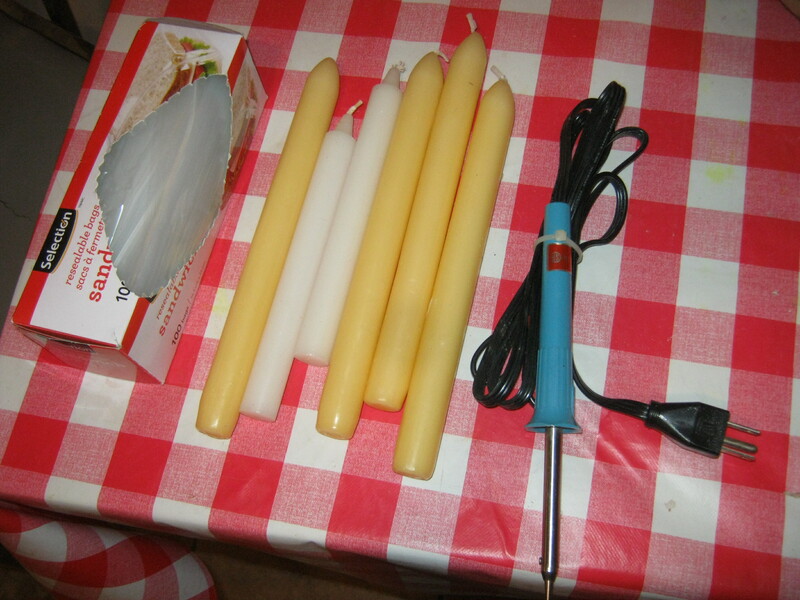 Some candles, a box of sandwich bags (which was unopened), and a soldering tool which seems to work just fine. 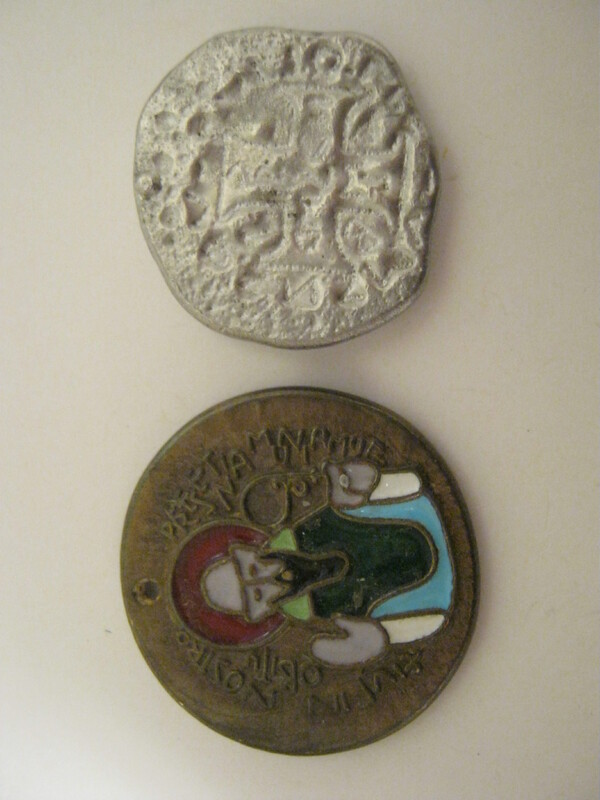 Inside were these two medallions. The back of the one on the left is the same as the front of the right – an Iron Cross with some odd lettering on it. I looked it up and it appears to be a Saint Benedict Medal, which is intended to ward off evil. The one on the right is odd because it’s sort of rough looking. The back is blank and sort of rounded. It’s either homemade or old, or both. I fantasize about it being hundreds of years old, but it’s more likely that someone just stamped it in their toolshop or something. I feel so sorry about the old Ukrainian lady who passed away,even though I did not know her and whose stuff was thrown on to the curb.Most of the stuff you photographed is not too valuable ,but it is very unfortunate that the executor or cleaner threw out the framed religious or Jesus photo of the lady in the garbage.I hope you retrieved that framed photo.Nobody’s art should be thrown out. Older people who have lived through war,hardship and finanicial adversity tend to accumulate useless things sometimes—-but can you blame her?If you lived through the Depression of 1929,would you also not be very parsimonious or likely hold on to things more than others ?If that woman was from Ukraine,you know how Stalin starved millions of Ukrainians to death in camps.GOD BLESS THE POOR UKRAINIAN WOMAN’S SOUL! I think the same way. People of the generation that went through the great depression didn’t take material possessions for granted because they knew how valuable things were (or could be). My grandpa was the same way. It’s a great constrast from today: we take material possessions for granted because we’ve never experienced economic hardships – not like they did, anyways. I’m intrigued by that second medallion. Does it look to be silver? I think it’s the type of cross known as the “Potent Cross”. Maybe do a rubbing of it onto tissue paper, to see if anything else comes up to identify it. I don’t know. It could be. I thought it could be lead but I think lead gets darker. I may bring it in to get tested by a jeweler at some point. It looks like a Saint Benedict medal, but the letters are backwards, as if it they were seen through a mirror. It’s quite crude as well. I’d be interested in that soldering tool you picked up. I find your blog both amazing and entertaining. I look for new updates everyday now. 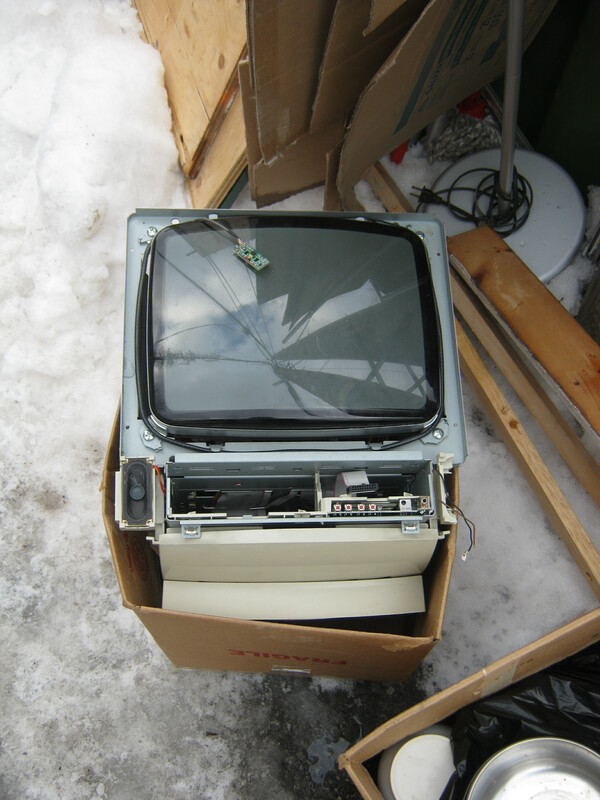 You’ve inspired me to be doing some dumpster diving of my own. 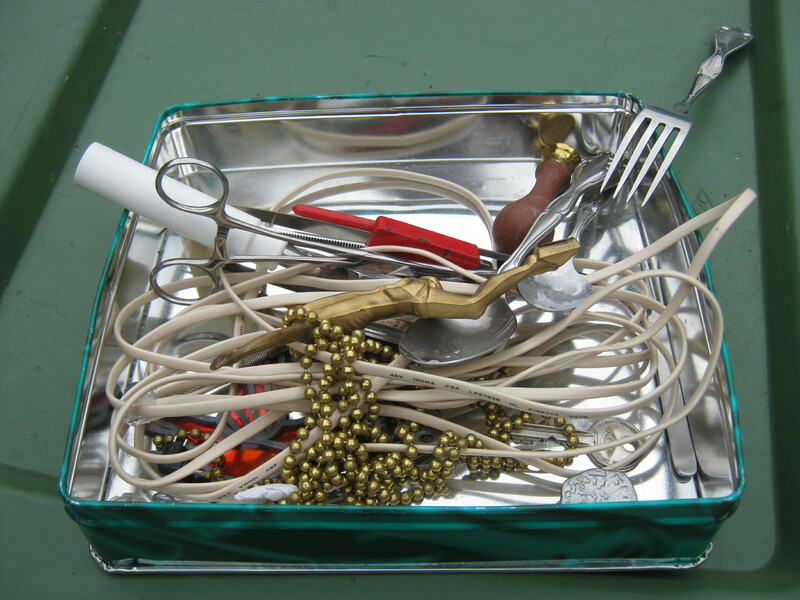 The soldering tool’s been spoken for, but I’m glad you like the blog! I hope you find some good stuff too… I can’t possibly save it all myself! 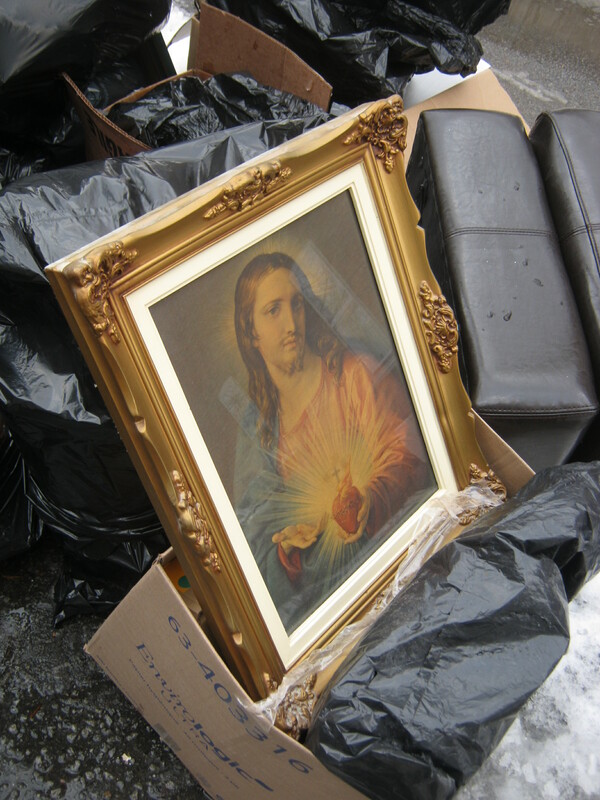 that framed image of jesus is an amazing find! I do a lot of trash rummaging myself and am also a fascinated collector of christian paraphernalia. Would be very excited to find that! Good one! Looking back I should have taken it! It was in great shape.